Remember to come back and visit the comments section during the week for your fellow poets entries! Haiku Poetry Prompt Writing Challenge Useful Links. The two words can be used as you like. Words have different definitions and you can use the definitions you like. You can even use a synonym word as long as it does not change the meaning. Go to Thesaurus.com for Synonym help. 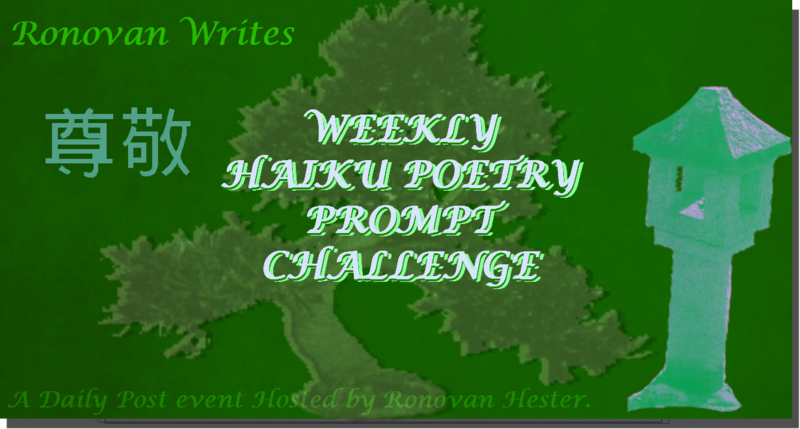 Use the Tag of Ronovan Writes Haiku Challenge. This will help me find you in case you forget to ping back or leave your URL in the comments. Copy the link of your finished haiku URL in a comment so we can all go and visit your site to see what you have done. You can do a ping back. What’s a ping back? Put the URL link in the address bar of this post, if you like, within your post. Your inclusion of the link encourages others to try the challenges out, be creative, and join a community to find friends and more followers (hopefully). I honestly gain nothing by more people visiting the post. I don’t have ads running I get paid for by your visit. Click HERE for a detailed article on Ping Backs. You may copy one of the badges/images appearing in this post below or above and place it on your site if you wish, most normally use it within their post. I am not saying you need to, but if you would like to do so then go ahead. It is simply my way of saying thank you for participating. I sometimes make custom images for the week, if time and health permits. The Challenge currently BEGINS at 8 AM EST (New York City time) on Mondays. And a DEADLINE is Noon EST (New York City time) on the Sunday following the Challenge Post release. Not sure how to write a Haiku? Click HERE for a quick How to write Haiku Poem in English Form with links to articles for other forms of Haiku. A bit longer than usual, so hope this is OK Ronovan. And? When our days had no end. Old times, old friends gone. Thanks Ronovan for the prompt that brought back such great memories for me! And here is my entry as my Pingback is not working. Hi Ronovan. Here’s my attempt: http://www.gwenplano.com/blog-reflections/tomorrow All the best to you! Please let me know what you like or don’t like about this tanka for Old&Days. Here is my entry for this week. A good weekend to all😊. Interesting possibilities in many directions for these two words.